While away from home, I usually set lights on timers to simulate someone at home. 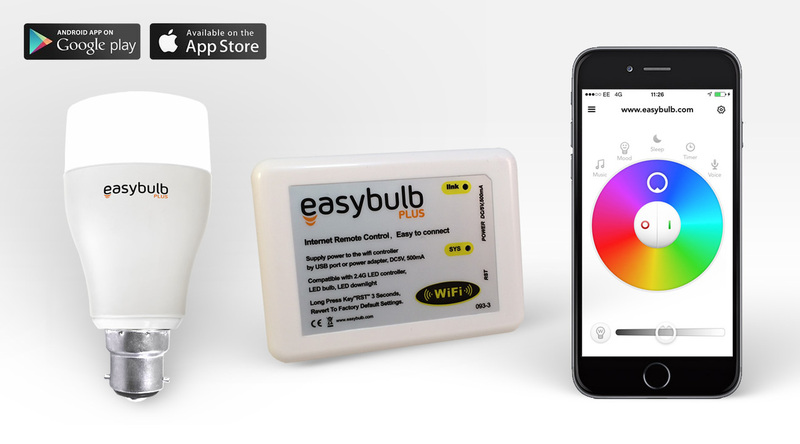 This year I used the Easybulb to do that – a 9 Watt bulb that not only can connect to my WiFi for control on my iOS or Android device, but also set timers to turn on and off. This system consists of two parts: the WiFi receiver which communicates between bulb and Internet, and the bulb itself which screws into any standard Edison lamp design. I plugged the WiFi box into the back of my cable box, which was in direct view of the bulb. I can also get a home remote if I don’t want to use my smartphone. The bulb itself is an RGBW – so I can set a mood with color, turn to white and dim it down. Perfect for setting up the room for watching a movie, snuggling by a fireplace, or just setting a nightlight if the kids wake up. The bulb itself is only 9 Watts and puts out 820 Lumens – similar to a 60 watt bulb. That means this bulb will take 111 hours before you use a kilowatt of energy. That is 20% more efficient than a traditional incandescent lamp. And the bulb itself will last up to 25 years. That is a lot longer than any incandescent or florescent bulb. So this bulb can be set to a timer and change color. But is it right for you? When we come back, I’ll go through the pros and cons. First problem I encountered was when I set the timer. The Easybulb re-synced the timer to whatever time zone I was in. Therefore, my 5-10 PM turned into 11 AM – 4 PM while I was in London’s time zone. The bulb was also a little difficult to make first connection. It took 3-4 tries before and I made sure the line of sight was very direct. Finally, it does work on Android and iOS, but not on Android tablets – won’t even allow you to install. I just did a video on $50 tablets which you might use as a home remote, but the Easybulb system wouldn’t be part of it. I like how you can set up multiple bulbs for white light, color, or mood lighting. The app can turn on and off lights wherever you are, and also has a flash feature if your phone rings – perfect for those with hearing difficulty or if you have the phone set to vibrate. For $64 you can get one bulb in Edison E27, E26, E14 small screw or Bayonet connector and WiFi receiver. Or get 4 bulbs with WiFi box for $135. In the long run, you will be saving a lot more in electric bills and bulb replacements.